At the blue lake of Annecy in France a number of churches are situated in the sun as quite witnesses of secret knowledge about the origins of Christianity. Hordes of tourists flock together to shoot stills with their digital cameras for their friends and family at home without probably realizing how extraordinary these churches really are. 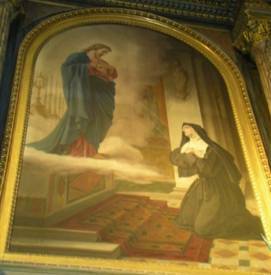 In the Notre Dame de Liesse in the centre of Annecy, an extravagant Mary worshipper is kneeled down bowing violently towards the alter praying to the virgin mother. He’s most likely completely unaware of the deeper mysteries surrounding the virgin mother. In front of the Notre Dame de Liesse an obelisk is placed on a fountain surrounded by four lions and four turtles, a clear sign that this church has a very remarkable story to tell. A first inventory using a digital watch with a compass shows that the church’s azimuth is in between 50 and 60 degrees North-East. For adepts this means the church is aligned to the summer solstice sun just like most of the Notre Dame Cathedrals in France are. Along with the obelisk, an Egyptian solar symbol it probably means that this church has something to say about the Egyptian roots of Christianity and her astrological connections. 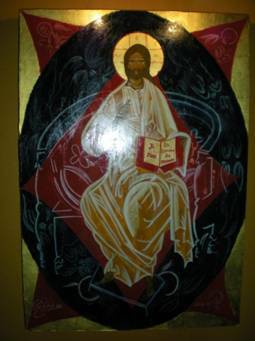 Inside the church a painting of the Christ reads ‘Je suis la lumiere du monde’ (I’m the light of the world). When a child is asked what the light of the world is, he or she would surely respond that this is the Sun. At the corners of this painting the four signs of the zodiac Aquarius (left upper corner), Eagle or Scorpio (right upper corner), Leo (left lower corner) and Taurus (right lower corner) are depicted. These are the four well known fixed signs of the zodiac forming a cross in the zodiac. Could this be the same cross that is depicted in Christ’s aura, the light of world? It’s a well known fact that people are able to see auras and for the less gifted people Kirlian photography offers the possibility to photograph the human aura. However never ever has anybody reported the presence of any cross in the human aura. Je suis la lumiere du monde, I’m the light of the world. There is another very interesting discovery to be made concerning the above mentioned painting. 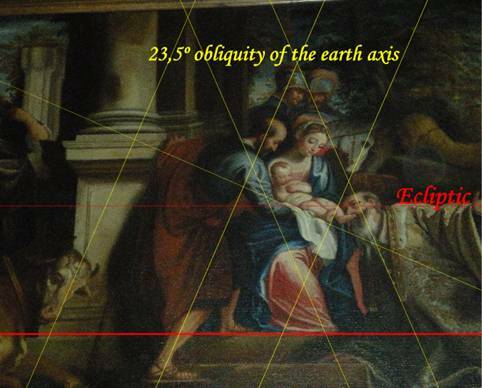 Gary Osborn discovered that in much Christian art work the obliquity of the earth axis has been encoded. The obliquity of the Earth is the tilting of the earth axis relative to a ecliptic axis. This axial tilt of 23,5 degrees not only gives our planet four different seasons as the Earth annually orbits the Sun, due to the wobbling of the Earth axis the Sun passes through all of the zodiac signs in a precession cycle of 26.000 years. Without the obliquity of the Earth axis, precession would not be possible. 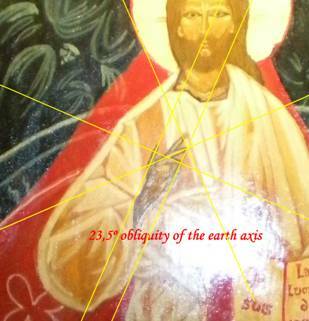 As we will demonstrate in this article the 23,5 obliquity is encoded in abundance in most of the Christian art work found in churches in Annecy! The significance of the application of this angle in the art work, is that it is esoterically alluding to the precession of the equinoxes! All of the fingers of Christ’s hand make angles of 23,5 degrees. 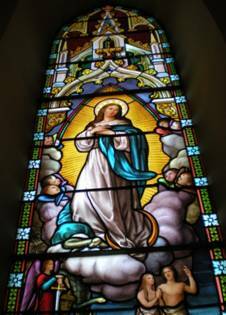 It’s even getting stranger when Mary, the mother of the ‘light of the world’ in this church is depicted in between these four signs of the zodiac in one of the leaded glass windows. 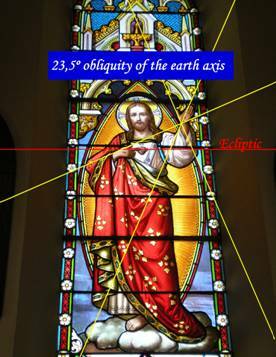 This window is situated straight above the entrance of the church and along with the obelisk hence welcomes the summer solstice Sun on June 21st. Mary surrounded by the four signs Eagle (Scorpio), Aquarius, Taurus and Leo. At the roof the church a golden statue of Mary on a celestial globe is placed. The celestial globe is ‘embraced’ by two horns. The statue reminds one of Isis of ancient Egypt who was always depicted with two cow horns on her head along with a big orange ball in between the horns representing the Sun. In the surroundings of Annecy this Notre Dame church is the centre of a Black Madonna cult that is revealing not only the similarities between Mary and the Egyptian Isis, but the true origins of Christianity at the same time. In ‘The mysteries of 2012’ Sharron Rose writes about the Black Madonna holding her son in her arms. According to Rose, exoterically the son she’s holding represents Jesus, the son of Joseph and Mary, but esoterically she’s holding Horus in her hands the son of Isis and Osiris. Horus was the Egyptian solar deity born from the virgin Isis. Horus was re(born) on December 25th, just four days after the winter solstice, the day that he sun ‘died’ at the cross of the zodiac to be resurrected in the heavens after it had reached its lowest inclination at the winter solstice (December 21st). 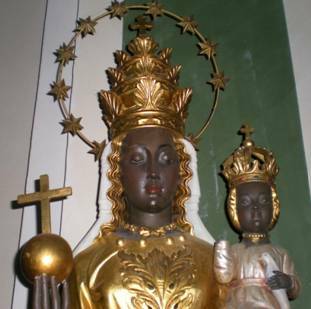 In the nearby church Saint Maurice the Black Madonna is holding the golden ball of the heavens, the Sun, in her hand with the ‘Christian cross’ on top. Around her head she’s wearing a band of 12 stars, an astrological reference to the twelve signs of the zodiac. The Christian cross on top of the golden Sun is a reference to the cross of the zodiac. Another way to express the importance of this cross has been used by Leonardo Da Vinci in a very cunning way in his ‘Last Supper’ by grouping the 12 apostles in four groups of three. 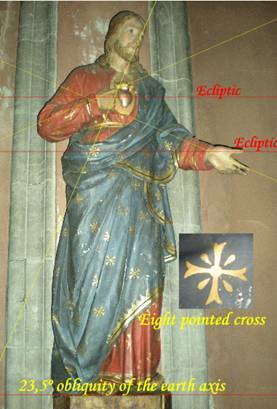 Christ as the light of the world (the Sun) had twelve apostles who represented the twelve signs of the zodiac. By sorting the apostles into four groups, the cross in the zodiac is denoted that divides the twelve into four groups of three. 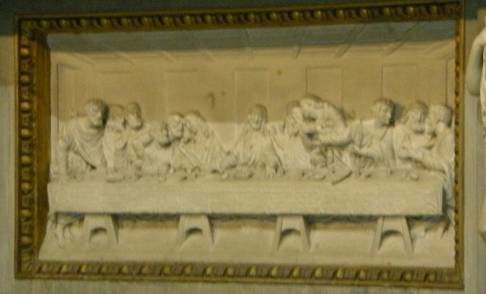 Exactly the same symbolism has been used in the depiction of the ‘Last Supper’ at the altar of the Notre Dame de Liesse in Annecy. As we will demonstrate in this article there are two very important crosses in the zodiac that around 2012 will merge again after a period of separation of 6480 years. The place of the Sun in the heavens during the time of the merger of these crosses (in between 1978-2017) at the summer solstice is the exoteric birthplace of Christ and the esoteric birthplace of the Sun in the 26.000 year precession cycle. As will be explained next, the Isis mythology and the esoteric meaning of the Sun in between her horns correspond perfectly with the place where the Sun will be reborn around 2012. This is the ‘End Times’ the bible is referring too and the exoteric Second Coming of the Christ in reality is the esoteric rebirth of the Sun in the precession cycle. The Sun casts its exoteric shadows over Christianity. 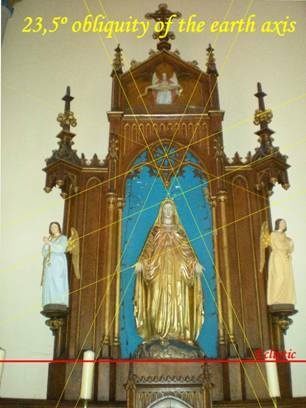 In the cathedral Saint Pierre of Annecy, just around the corner of the de Notre Dame de Liesse, the Mary-Isis-precession association is depicted by means of a statue of Mary standing on top of the celestial sphere decorated with stars. Behind Mary the Sun along with her rays is depicted. The Sun is ‘embraced’ by the horns of Isis at the bottom of the celestial sphere. At Mary’s feet the Greek mythological Ouroboros snake bites its own tail. The Ouroboros (literally meaning tail-biter) stands for cycles in nature in general and the precession cycle in particular. The biting of his own tail expresses the start and endpoint of the cycle. This point is the Alpha and Omega of Christ, the (re)birth of Christ as the Sun in the precession cycle. Cathedral Saint Pierre Annecy, Ouroboros biting its own tail, the Sun in between the horns of Isis. In this piece of Christian art work, all of the fingers, hands and arms of the characters make angles of 23,5 degrees. There are simply no exceptions! All of the character’s fingers, hands and arms make angles of 23,5 degrees, marked by the yellow lines in the picture above. 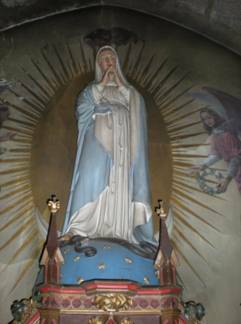 In the church of the little village Duingt at the lakeside of Annecy another status of Mary is found proving that the symbolism is no singularity and by no means a coincidence. In this case Mary is depicted on a cloud. The esoteric meaning of this cloud is that it represents the Milky Way, the cloudy stars in the night sky. 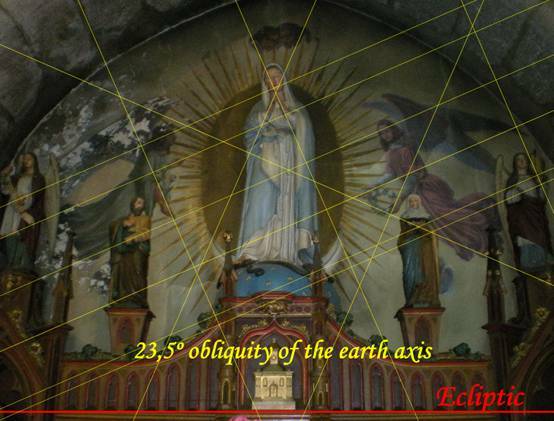 The church also has a statue of Mary on the celestial sphere with the Ouroboros. Mary in a Vesica Pisces (Sun), horns of Isis and Ouroboros. 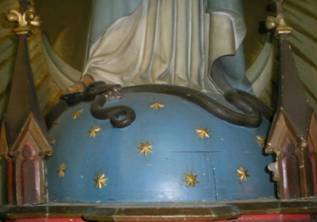 Statue of Mary on the celstial sphere with the Ouroboros. Mary and Jesus using their fingers to point to the Earth axis and ecliptic. 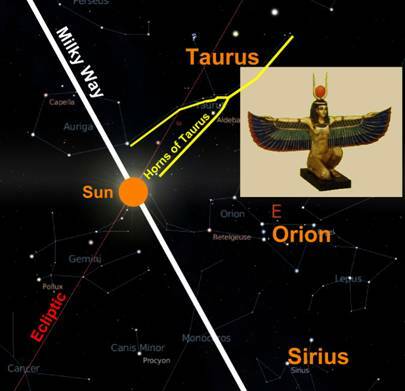 The secret of the Isis mystery is that it encodes the birthplace of the Sun in the precession cycle. The Sun in between the horns of Isis represents the Sun in between the horns of Taurus. . Exactly in between the horns of Taurus the crossing of the ecliptic and the galactic equator (Milky Way) resides in exactly 5 degrees Gemini of the sidereal zodiac. It is this place where the Sun resides at the summer solstice in between the years 1978-2017 and it explains why most of the Notre Dame cathedrals including the Notre Dame de Liesse in Annecy are aligned to the summer solstice. At the summer solstice in era-2012 the Sun will pass through the Alpha-Omega point of the precession cycle. A precession cycle of 26.000 years will be concluded after the Sun’s travel through all of the 12 constellations of the zodiac and a new cycle will commence. Exactly half a year later the Sun resides again at the crossing of the equator of the Milky Way and the ecliptic, this time the winter solstice Sun resides at the other end of the zodiac in 5 degrees Sagittarius. This event is better known as the Galactic Alignment associated with the ending of the Maya calendar at the 21st of December 2012 by John Major Jenkins. The Christmas tale starts to tell its own story now. Prior scholars and researchers have suggested that the Three Kings from the East in the Christmas tale could have an astronomical connotation and could be a symbolic reference to the three belt stars of the Orion constellation. The star Betelgeuse of Orion has been suggested to be the star of Bethlehem. These astrological associations get even stronger when the ox of the Christmas stable is added representing Taurus. The shepherd dog symbolizes Canis Major better known as Sirius the Dog Star. Mary with her newborn child (Isis with Horus) should be the reborn Sun in between the horns of Taurus at the crossing of the ecliptic and the Milky Way. In Eglise Saint Maurice at a walking distance from the Notre Dame in Annecy a very interesting painting is portraying the birth of Christ convincingly revealing all of the above astrological associations. 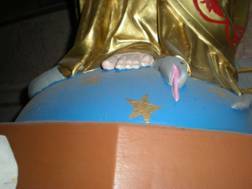 The stretched out arms of one of the Three Kings kissing the feet of the Christmas child is a reference to the ecliptic. As I have argued consistently in several articles, in freemasonry pillars, clouds and rivers are esoteric symbols of the Milky Way. Close up of the Christmas tale with the 23,5 degree lines denoting obliquity. Compare this painting with the depiction of Isis and the era-2012 summer solstice Sun, both pictures although mirror images of each other are completely identical! The birthday of Christ is of course not the 21st of June (summer solstice) but December 25th, four days after the winter solstice. In ancient times this was the birthday of Horus the son of Isis. At both the summer and the winter solstice in the period surrounding 2012, the Sun is reborn at the crossing of the ecliptic and the Milky Way. So there are actually two birthplaces, one in 5 degrees Gemini and one in 5 degrees Sagittarius of the sidereal zodiac. The painting represents the Sun at the summer solstice in 5 degrees Gemini in between the horns of Taurus, but the conjugate galactic alignment occurs around the winter solstice in the same period in between 1978-2017 in 5 degrees Sagittarius. Hence the birthplaces of the Sun in era-2012 resides on the Galactic Cross. The first axis of this cross is the galactic equator and connects the two birthplaces of the Sun exactly where the Milky Way and the ecliptic cross. The second axis is perpendicular to the first and connects 5 degrees Virgo with 5 degrees Pisces. The Galactic Cross conceals the esoteric aspect of the mystery of Mary. This is because Virgo corresponds with the Virgin Mother Mary and Pisces with Christ. Christ was a fisherman and the universal symbol of Christianity since the beginning of Christianity is the Vesica Pisces (Fish symbol). 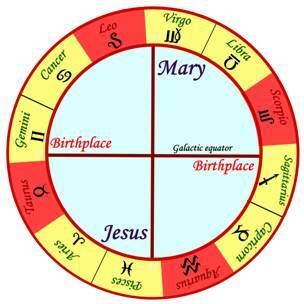 The Galactic Cross connects the birthplaces of the son (the Sun) on the galactic equator with the Virgin Mother (Virgo) and the newborn son Jesus Christ (Pisces). Esoteric significance of the Galactic Cross that connects the mother with the son and the birthplaces. As mentioned in the start of this article, this astrological event around 2012 can also be understood in terms of the merger of the two crosses of the zodiac. The first cross is the orthogonal equinox-solstice cross; the second cross is the Galactic Cross. The latter cross was denoted in ancient times by the four signs of the zodiac Leo, Taurus, Aquarius and Scorpio (or Eagle). These are the constellations that heliacal rise (before the Sun) during a Great Celestial Conjunction (the astronomical event of the merger of the two crosses). 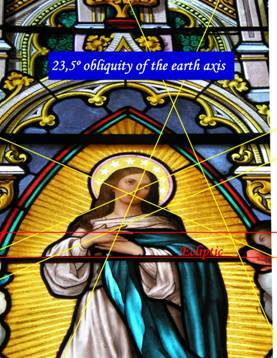 These signs occur in leaded glass window with Mary above the entrance of the Notre Dame the Liesse as well as in the painting of Jesus with the text ‘Je suis la lumiere du monde’ described at the start of this article. The two crosses that in the past 6480 years formed an eight pointed cross will merge to form a single four pointed cross around 2012. As I have explained and demonstrated in several articles, the eight pointed cross is a symbol of the Great Celestial Conjunction of 2012. It represents the alpha and the omega of the precession cycle, the Ouroborous biting its own tail. In the Notre Dame de Liesse a painting is hanging from the wall representing the Resurrection of Christ (rebirth of the Sun) with an eight pointed cross depicted underneath Christ. Christ is standing on a cloud. The cloud not only suggests the risen Christ since only deceased souls from the spirit world will be able to stand on a cloud, from an esoteric viewpoint the cloud is a symbol of the Milky Way. The risen son of God standing on a cloud esoterically symbolizes the new born Sun on the Milky Way. It is the same symbolism used for the obelisk in front of the Notre Dame de Liesse. By placing the obelisk (sun token) on the water (above the fountain) the Sun on the Milky Way is suggested. The ancients regarded the Milky Way as the great river in the sky. For the Egyptians the Nile was the reflection of the Milky Way on the earth, as above so below. In Eglise Saint Maurice in Annecy a statue of Christ dressed in a long robe decorated with eight pointed crosses is found. The eight pointed cross can be found in abundance in churches around the world and almost in all cases these crosses are composed of two separate four pointed crosses. Notre Dame de Liesse, risen Christ on a cloud (Milky Way) with the eight pointed cross. Christ as a symbol of the reborn Sun at a Great Celestial Conjunction. His fingers in both his hands make 23,5 degree angles and also his face is tilted under this angle. Even the crucifixion of Christ seems to mimic and express the precession cycle. The crucifixion takes place in twelve separate episodes called the Stations of the Cross starting with first Station of the Cross; the condemnation to death by Pontius Pilate and finishes with the actual crucifixion in the twelfth Station of the Cross. These twelve Stations of the Cross refer to the twelve signs of the zodiac. 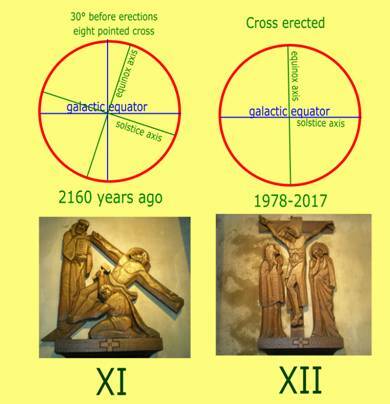 The erection of the cross at Christ’s crucifixion can therefore symbolically be taken for the erection of the equinox axis perpendicular to the galactic equator. During the Great Celestial Conjunction of 2012 the equinox axis will be standing vertical on the galactic equator in the zodiac. The astrologist Nick Fiorenza has coined this event the ‘The erection of the Holy Cross’ (www.lunarplanner.com/HolyCross.html). Jesus falls exactly three times during the Passion on the Via Dolorosa at the third, seventh and the ninth Station of the Cross. In an alternative narrative of the Stations of the Cross, Jesus falls only once on the sixth Station of the Cross. It’s remarkable that the Stations of the Cross, 3, 4, 6, 7 and 9 are not attested to in the gospels. It’s therefore interesting to realize that Jesus his fall on the Stations of the Cross 3, 6 (7) and 9 with his crucifixion at 12 again form a perfect cross in the Passion of Christ. Even in Christ his death struggle in the twelfth Station of the Cross a four pointed cross can be discerned. Christ was crucified at 9 o’clock in the morning. At exactly 12 o’clock the land became dark for 3 hours. At 3 o’clock in the afternoon Christ exclaimed ‘My God, my God, why have you forsaken me?’ after which he died on the cross. He was wrapped in cloths and put to rest in the tomb of Joseph of Arimethea in a rush just before the start of Sabbath at six o’clock. Nine, twelve three and six form a perfect cross in the face of a clock, symbolically referring to the twelve hours in the precession cycle, the twelve signs of the zodiac and the cross therein. While Jesus was born around the winter solstice, he died around the spring equinox, the day of the Jewish Passover or Pesach. So even his birthday and day of dying correspond with the equinox and solstice cross of the zodiac. During a Great Celestial Conjunction Horus dies on the cross of het zodiac after completion of the 26.000 year Great Year and having passed through all of the signs of the zodiac. The zodiac cross (equinox-solstice) axis has now finally been erected again after 6480 years. This moment represents a Great Celestial Conjunction (Smelyakov-Wicherink 2006). After 2017 both crosses will separate again, the cross will tilt and the Sun has risen from death (Resurrection of Christ) to start a new precession cycle of 26.000 years all over again. The ending of the precession cycle, the current Great Celestial Conjunction around 2012 is what Christianity has come to denote ‘The end of Times’ and corresponds with the Second Coming of Christ (the Sun). The ‘light of the world’ now shines brightly on the shadow side of Christianity and clearly reveals her origins. We write the year of the Lord 2008, it is the time of Revelations where everything has been prophesized to be disclosed. It’s a crucial time in which humanity collectively has come to a junction and has started the collectively write the last chapter of the bible.